What is Motivyst (Canagliflozin) used for? As part of the combination therapy with other hypoglycemic medications, including insulin. After oral administration, up to 65% of the substance is absorbed in the gastrointestinal tract. The peak plasma concentration is achieved in 1-2 hours. Plasma protein binding is 99%. The substance is metabolized in liver, with the elimination halftime of 10-13 hours. How should I use Motivyst (Canagliflozin)? One film-coated 100 mg tablet contains 102.0 mg of canagliflozin hemihydrates as an active ingredient which is equivalent 100 mg of canagliflozin. 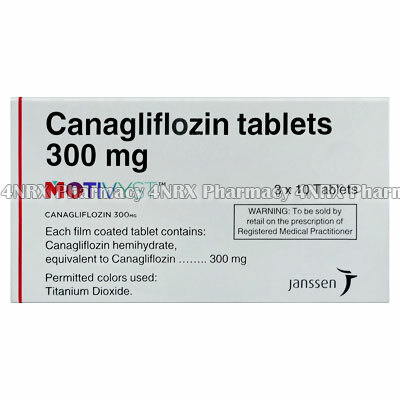 One film-coated 300 mg tablet contains 306.0 mg of canagliflozin hemihydrates as an active ingredient which is equivalent 300 mg of canagliflozin. Motivyst (Canagliflozin) is supposed to be taken once a day before breakfast. Standard prescribed dose ranges between 100-300 mg. The maximum daily dose and maximum single dose should not exceed 300 mg.
What are the side effects of Motivyst (Canagliflozin)? Central and peripheral nervous system: dizziness, asthenia, syncopal episodes, and mental confusion. Cardio-vascular system: postural hypotension, dehydration, seizure, ishemic stroke. Digestive system: thirst, dry mouth, vomiting, constipation, pancreatitis. Musculo-skeletal system: lumbar spine and femoral bone osteoporosis. Dermatological reaction: itching, acne, hyperhidrosis; rarely - photosensibilization. Urinary system: glucosuria, polyuria, itching and burning with urination, urosepsis. Reproductive system: dyspareunia, candidal vulvovaginitis, balanoposthitis, urinary tract infections. Safety and efficiency of using Motivyst (Canagliflozin) in children hasn`t been studied. Patients over the age of 75 years should be prescribed the initial dose of 100 mg taken once daily. Other factors that have to be taken into account are the kidney function and the risk of hypovolemia. In the first three months of treatment with Motivyst (Canagliflozin), it is not recommended to drive vehicles or operate moving machinery. No overdose cases have been registered; however any overdose has to be treated symptomatically. No clinically significant interactions have been registered.